Click here for the most recent edition of the Barre Blast! In 4th grade we did an amazing science friction and energy experiment! If you want to know how to do this yourself and have a ton of fun learning, read on in this blog. 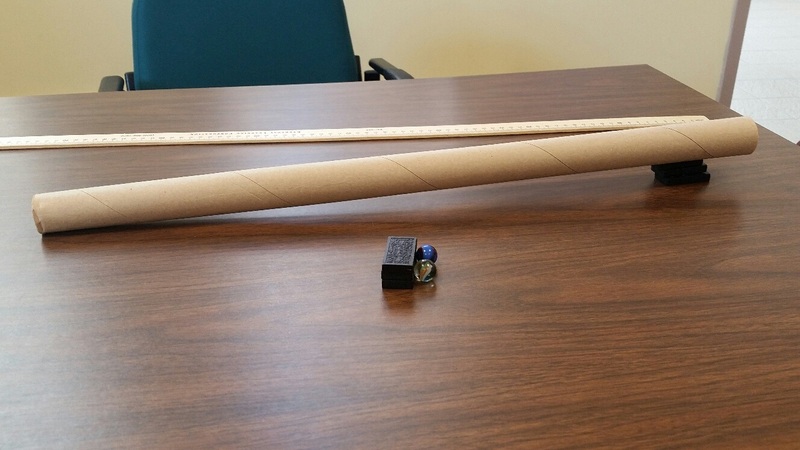 The above picture shows the materials you need: 1 wrapping paper tube, 6 dominoes, 2 marbles and a meter stick. What happens in this experiment is we stack three dominoes on a surface. We balance the tube on the dominoes then we roll down the marble and when the marble stops we measure how far it went in centimeters. Did you know that 100 cm = 1 meter? Question 1: Would the marble go farther on a rug or a smooth surface? Our hypothesis was that the marble would go farther on a smooth surface because the carpet creates more friction. Click here to see what happens on the rug and here to see what happens on a smooth surface. Question 2: If a marble collides into another marble, would it go farther or shorter than it went in Question 1? Our hypothesis was the marble would go a farther distance because when they collide it will give the second marble a boost of energy. Click here to find out what happens! Question 3: If we used 6 dominoes instead of 3, would the marble go father? Our hypothesis was yes, it would go further. The more dominoes the bigger the slope. The bigger the slope the more force on the marble. Therefore, the marble would go farther. Click here to see the results! 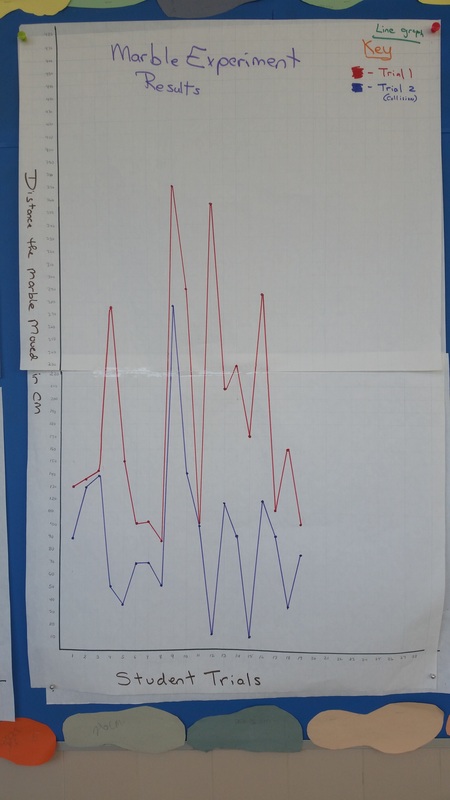 After we did our experiment we used our mad math skills to create graphs of our data. They are posted in the 4th grade hallway for all to see. You can see one of our graphs in the picture above that graphs question 3. 19 students recorded the data from their two trials on the above line plot. The blue shows the collision, the red is without the collision. As you can see, our hypothesis was incorrect – the marble goes a shorter distance (about half) with the collision. We learned that the instead of giving the marble a boost they share energy which is why it went shorter than without the collision. This was the most interesting part of our experiment. We found that interesting because we thought the opposite. This experiment was fun because we learned new things about friction and energy while having a great time! My name is Duncan and I am in Mrs. Clark’s 3rd grade class at Ruggles Lane. Recently I had to do a biography project. I chose the Wright Brothers because they made man’s first flight. I did not know about the Wright Brothers before hand but I know about their entire life story from birth to death now! I used voice note and wrote a paper with facts. My mom and I also went on a website to learn more about them. Did you know they had two older brothers, one younger sister and two siblings who died as babies? Part of our project was to make a puppet. As you can see from the picture above, I didn’t just make the puppet. I also made the 1903 plane with my Papa. I covered the wings with the sticky paper. My Papa and I found a good shape for the propellers. My mom and I made the puppets together out of water bottles. It was a lot of fun! For my presentation today, my brother Braden was Wilbur Wright and I was Orville. This was a family project! Click here to watch my presentation to the class! The most interesting thing I learned was that they were interested in making man’s first flight. In 1900 they made a glider and it didn’t work. In 1901 they made a glider and it didn’t work. In 1902 they made a glider but they needed to power it and they added an engine and propellers. In 1903 they finally finished the plane that they were going to fly and on the last try when Orville was trying it he flew it and that was man’s first flight. Another fun fact I learned from my project is that the Wright Brothers lived on Hawthorne Hill in Oakwood, Ohio, a suburb of Dayton, Ohio. 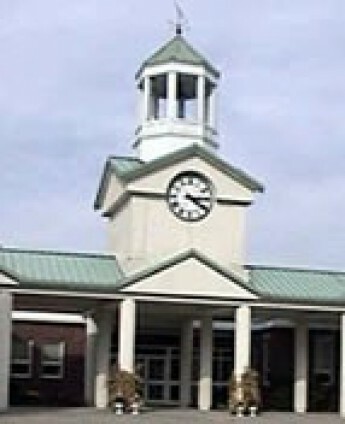 Ms. V went to high school in that town. Her high school is down the street and she went sledding down the big hill at their house! One of the things I learned is that it is important to never give up when you make a mistake. If the Wright Brothers had given up then maybe we wouldn’t have airplanes and we couldn’t get places that are far away.